Whether you’re moving yourself or are supporting your parents as they transition into a smaller space, Reduce Resize Revive; the Upside to Downsizing is the only roadmap you’ll need to simplify your surroundings so you can focus on what matters most – the freedom to do more of what you enjoy so that you can live each day to the fullest. 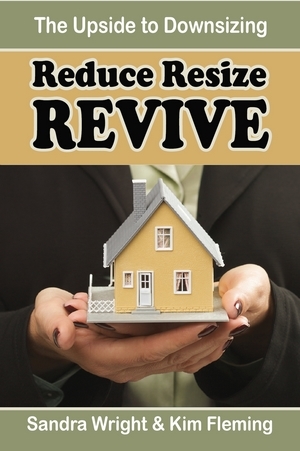 With real life wisdom from two of the industry’s foremost authorities on household organization and life transition downsizing, as well as personal accounts and anecdotes from dozens of seniors, Reduce Resize Revive will help you plan, prepare and embrace your downsizing journey. Throughout these pages we will take you through the downsizing process, step by step, beginning with “thinking about it” right through to adjusting to your new home. Moving later in life is not just another move. This is a major transition where you will cross the threshold into the next phase of your life. Older adults who proactively make the needed adjustments and changes that benefit this phase of life are becoming the new role models for our aging population. Are you ready? Enter your email address below to securely purchase and download a digital copy of Reduce Resize Revive that you can read immediately, via PayPal. $10.00 for the digital version of the book. Click the “Buy Now” button below to securely purchase a soft-cover copy of our book via PayPal. $19.05 for the book plus $2.48 HST and $4.40 shipping + handling. If you are in the business of caring for and/or working with seniors, we understand the importance of companies like yours wanting to get your message out to your clients and their families through the appropriate medium. With this mutual understanding, we are excited to offer your company the opportunity to customize Page 1 & Page 2 of Reduce Resize REVIVE to get your message communicated to our shared target audience. You can use this book as a promotional item, a thank you gift or as a means of advertising to your target market. With the ability to customize Pages 1 & 2, you will have the opportunity to share your story with your audience, whether you want to speak about your experience, your expertise and/or the unique services you offer. Reduce Resize REVIVE can serve as a resource to you and a tool that will enhance your marketing strategy while enabling you to connect personally to potential clients. Join the Retirement Residences, Senior Real Estate Specialist and Accredited Senior Agent Realtors®, Moving Companies and Home Care providers who have already customized their copies of Reduce Resize REVIVE and reaped the benefits of this unique marketing opportunity. View a sample of a branded page to see what yours could look like. Kathy, Cedarvale Lodge in Keswick Ontario.